A typhoon has found its way to my doorstep again. The sky is gloomy and the rain is steadily falling. Days like these call for hot soups, or hearty braises, or something roasted whole. We will go for the roast I think. A roast chicken dinner sounds just about right. And hopefully there will be leftovers for me to use and post about! Meanwhile (if there are leftovers…C loves roast chicken), I am bursting to share with you something we (I and a group of three other fabulous girls…Christine, Angela, and my best friend K!) have been working on for a while. It’s been so much fun and so satisfying planning this little project with them…now that it has actually come to fruition, and I can hold the tangible results in my two hands, the delight is immense! You can check out the different bags (with better pictures!) at our website. They’re available in Metro Manila only for now until we can sort out shipping. You can also find all sorts of interesting links there – from information about the threat plastic poses to our environment, to other eco-friendly products made locally. 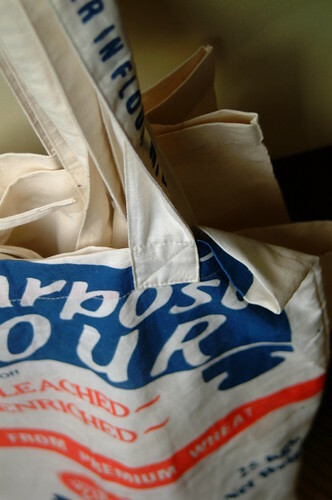 One bag line is made of canvas and the other is made of recycled flour sacks. Yes, we’ve been badgering our favourite bakeries for more than just their cakes! 😉 I’ve already taken both out for a spin and I can say (with no bias whatsoever, heehee!) that they perform commendably! They can both lug around quite a load 🙂 Lots of space for all your shopping, boys and girls! ***Aside from being kinder to the earth, reusable shopping bags look much nicer than plastic bags do. Plus, it is so much easier to carry three of these bags on your shoulders, than five plastic grocery bags with your hands. Trust me. I live on the third floor and my elevator is, uh, “charming” at best. I know what I’m talking about. « Lavash with a Vegan & Gluten-Free Dip…Do I Dare?